Create, sell, or purchase one-of-a-kind jewelry, fiber, ceramics, glass, wood, paper arts, and mixed media arts. The gallery will be decked out for the holidays. Come pick out a one-of-a-kind hand made gift from our artists. We will have a colorful selection of ceramics, fused glass, mosaic, paper, fiber, and wood arts as well as beautiful jewelry. This year we will also be featuring framed two dimensional paintings 12"x12" or smaller. The gallery will be open from 11am-5pm Thursday through Sunday. 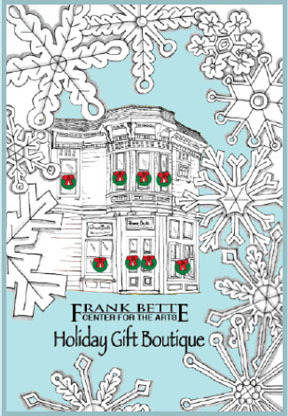 Boutique closes Sunday, December 21st. Pick up day for unsold works Sunday January 3rd, 2016.